Are you a Westerner living the expat life in a developing country? Then you know what happens when you visit the place where your roots are. We all experience the obvious: We’re overwhelmed by the excesses, the abundance of everything everywhere. Twenty brands of toilet paper, laxatives, painkillers. Supermarket aisles the size of airport runways dedicated to breakfast cereal, laundry detergent, wine. You stand there, paralyzed because you don’t know how to make a choice. Water runs from your faucet at all times, the electricity (almost) never fails and the phone always works. I could go on, but you know what I mean. But something else happens to me also: I notice the little things, incidents or scenes that never would have registered with me. Here’s one of them, a little snippet of life in Holland, the place I sprung from. Oh, and the photo? Authentic working wooden shoes, shot on a farm. And no, I’ve never lived on a farm in Holland, and I’ve never owned a pair of wooden shoes, but I just love this picture. Photo credit: Wessel Cirkel. I’m in a supermarket in the town of my birth in the north of the Netherlands (twenty brands of toilet paper, a hundred kinds of cheese). I’ve not actually lived here for decades, but I visit regularly so I don’t forget what it means to be Dutch. The Dutch are a frugal lot. Well, the older folks are. They remember being poor, says my mother, pursing her lips. She judges me and the spoiled younger generations as nothing but reckless spenders and wasteful consumers. My mother washes disposable forks. The supermarket offers a shoe repair service and they’re running a special this week. Fascinating stuff, I know, but that’s what I’ve got for you right now. A sprightly old lady is handing over a pair of shoes to the young girl behind the counter, eager to take advantage of the reduced prices. I guess her to be well into her eighties. Her curly gray hair is nicely coiffed and rinsed, framing a face with lively blue eyes and rosy, outdoorsy cheeks. Clip-on earrings of faux pearls the size of cocktail onions decorate her lobes. She’s protected from the elements by a neatly belted raincoat, vintage 1970. Support hose and sensible, low-heeled shoes complete the picture. Can you see her? The brown oxfords she’s brought for repair are equally sensible. She requests new heel pieces, which the young blonde thing behind the counter dutifully enters on a slip of paper. The old lady smiles at her. The girl smiles back vacantly, apparently not riveted by this conversation. She has purple nails and long dangling earrings in the shape of little skeletons. Clearly, her interests lie elsewhere. She requests name and phone number, which grandma supplies. The girl says, yes, they are, and smiles patiently as she puts the shoes away. They’ll be ready for pickup on Friday, she adds. I can’t see the shoes the girl is wearing, but I have an idea they’re trendy affairs and she’s never in her short life had her shoes repaired because they were still in good condition. Neither has she lived through a depression and a world war. Then again, neither have I.
I’m waiting in line to drop off a roll of film for processing (I’ve not yet gone digital), which service is offered at the same counter. The blonde turns to help the customer in line ahead of me and the old lady steps aside and looks at me, still smiling, happy with her frugal self. Her lips have been colored a modest pink and her teeth have the perfect, even look of dentures. A colorful scarf is neatly tucked into the collar of her raincoat, the blue matching her eyes. She nods eagerly. “That’s what I was saying to my husband!” She smiles, happy to have found a kindred spirit in me. Life is full of sorrow–find your happiness wherever you can, that’s my motto. She goes off to do her shopping, walking confidently away in her sensible shoes. It is now my turn and I hand over my roll of film to the purple-nailed chick behind the counter. My pictures will be ready on Thursday she tells me, the skeletons swinging cheerily from her ears. When she turns away and walks a few steps to put away the film, I catch sight of her shoes. She’s wearing white Nikes, the modern version of sensible shoes. So, I was wrong. It happens, you know. I do my shopping, making sure to take advantage of the special on aged Gouda cheese. Me, I get off on cheese. 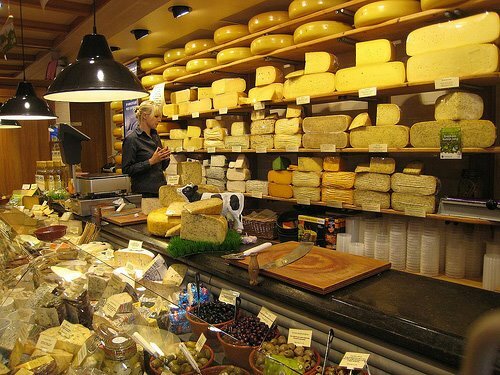 How do you like this photo of a Dutch cheese shop? Credit goes to Molly Kleinman, who also loves cheese. Anyway, I’ll put my aged Gouda in my suitcase and take it back with me to Ramallah where I live at the moment, along with lots of chocolate, ginger cake, spice cookies . . . oh, you don’t care. As I’m putting the groceries into my mother’s zippy red car I see the old lady in her belted raincoat take her bicycle out of the rack (remember, this is the Netherlands, not New Hampshire). It’s an old-fashioned model, but well-maintained and in excellent condition. She walks the bike to the curb. She sees me and smiles. With quick, deft movements she hitches herself onto the saddle and with a cheery wave of her hand she is off. Clearly, she’s in great shape. No repair necessary. I love your blog, Miss Footloose! I am from Seattle, and I bring back smoked salmon, which from my neck of the woods is a much heartier smoke than the pallid stuff that comes from Scotland. Sometimes, I smuggle tiny bottles of vanilla extract into this alcohol-free country, and sometimes special snack mixes and I make them last a long long time . . .
Just a Plane Ride Away: I’m not crazy about raw herring myself, although I’ll have a bite now and again. It’s an acquired taste! When in non-western countries I always considered it a challenge to fix meals with whatever was on hand. You learn to be creative! I always cook from scratch now because I like it that way. I know what I’m eating — and not eating! The Dutch supermarkets have lots of fresh produce, local and imported and I can’t imagine why Americans would have a problem finding good things to eat and cook. Eet smakelijk! LadyFi — crumpets! They sound really good but I’m not sure what they are. May find out in July when I’ll be in the UK for a week. Yes, Chapsticks, I bring those too. I’m in the US right now (West Virginia). The story was about my visit home to Holland some years ago when I lived in Ramallah, Palestine. When I visit I usually stay 10 days or so. Oh – I love the vivid portrait you paint of the old lady and her shoes. When I lived in China, I was desperate for cheese, coffee and chocolate. Now, when I go home to the UK, I find myself bringing back stuff like Branston’s pickle and crumpets. And chapstick, which I just can’t find over here. I love your blog and all your interesting stories and your writing is so vivid. I love the cheeses in France, Holland and Denmark. When we lived in Belize, I was so frightened of customs charging me extra that all I brought back was face cream, sunblock, favorite shampoos and gum, perhaps batteries. How long are you staying in Holland. Isn’t there a problem with customs when you go back?